As a participant in this exciting event, you will embark on a three hour excursion on the rails of the Conway Scenic Railroad in the Mt. Washington Valley. You will be served a delicious 4 course meal as you are mesmerized by a theatrical performance you won’t soon forget! 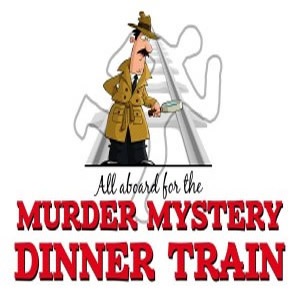 Passengers can participate as much or as little as they like in the tongue in cheek humor and zany antics that will keep everyone on their toes as they work the clues to determine the killer on board. Trains are scheduled to leave the station on Saturday night June 8th, Saturday night June 15th, Friday night October 25th, Saturday night October 26th, Friday night November 1st and Saturday night November 2nd. Our special package rate of $450.00 per couple, which covers all taxes and gratuities, includes two nights lodging with a full country breakfast each morning, two tickets to the Murder Mystery Dinner Train which includes a three hour train ride, two four-course dinners (alcoholic beverages additional) and a theatrical murder mystery performance.